Brooklyn Bread Club (BkBC) is a bakery that operates a subscription and market-based model. With a big concept – baking bread and other goods with stone ground flour from 100% Northeast grain – our model prioritizes interacting directly with our customers, millers, and farmers. After working with various flours and grains, exploring farms and mills, building relationships across the northeast, and even beginning the process of cultivating our own grains, we are ready to share the results throughout Brooklyn. The Northeast has the perfect environment to grow grains: cold winters and hot summers. With a higher gluten content than other types of wheat, the preferred grain for bread is winter wheat. This is planted in the fall, germinates, and then goes dormant in the winter, ideally under a snow cover. Come spring, the wheat “bolts” and is usually ready to harvest by the end of June. Rye follows a similar life cycle to winter wheat. Spring wheat, on the other hand, is planted at the start of spring and is harvested in the late summer or early fall and has a lower gluten content. High in protein, vitamins, minerals and carbohydrates, wheat is a beautiful, diverse plant that thrives when grown on a small scale. Most flour used in this country is milled using steel roller mills, a process that is less than 100 years old. Steel roller milling mechanically separates the three parts of the grain to isolate its most starchy and white features. Flour that is milled using this method is easier to work with, but has less flavor and less nutrition. As a result, the government requires that vitamins be added back into flour that has been steel roller milled. Alternatively, the stone ground method of milling has been used for thousands of years. Stone ground milling simply crushes and grinds the grain between two circular mill stones to make flour. The flour can then be sifted to remove pieces of the bran. The resulting flour cannot be categorized in the same way as that which has been steel roller milled – there is no white flour and no whole wheat flour. Stone ground flour is either flour that has all the bran or flour with the larger chunks of bran removed. 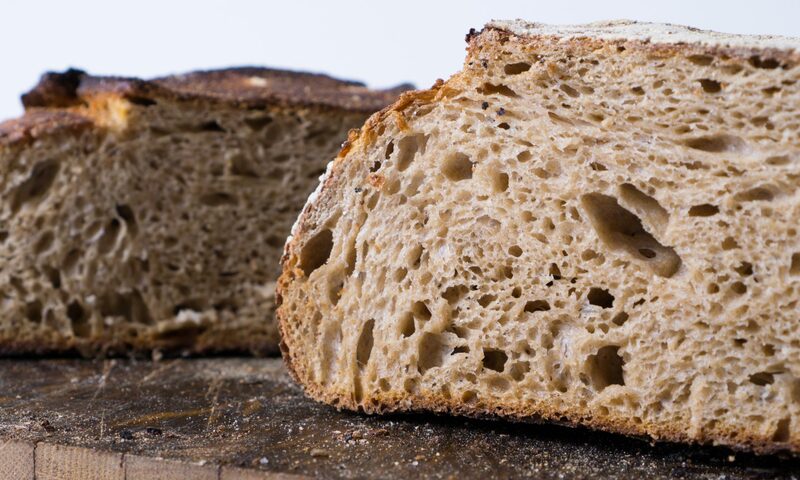 So by using stone ground flour you can have bread that is not categorized as 100% whole wheat, but you will be getting the same amount of nutrition and flavor (and then some) as 100% whole wheat flour. While eating bread and pastries made with stone ground flour is a flavor that many are not used to, it is tastier and healthier. Visit our “Join BkBC” website page to learn more about how the Brooklyn Bread Club subscription works: https://brooklynbreadclub.com/join-bkbc/. And check back for more details about market days and locations – more to come!